A sizeable crowd of booklovers and old friends packed into Raman's back room yesterday to hear Shirley Lim (pictured left, perching on top of a cupboard!) read from her latest novel Sister Swing and talk about the challenges she faced in writing it. 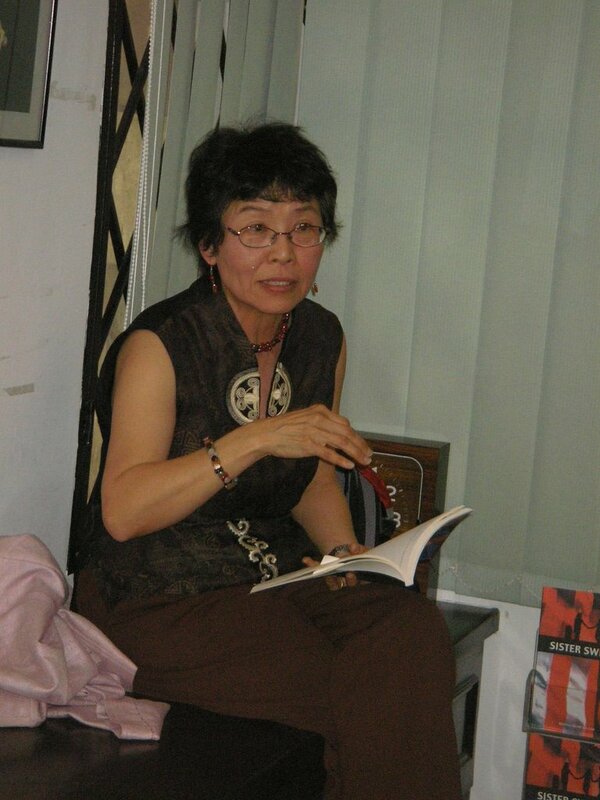 Lim explained that the novel about the three sisters had grown out of a short story (the now much anthologised Mr Tang's Girls) she had written very much earlier in her writing career. (It won the Asiaweek short story prize.) This time though, the girls kill their father in a completely different (and pretty inventive!) way and carry the burden of guilt throughout the novel. Swing is in fact the nickname given to the middle sister, Swee Wing, who is at times moody and contradictory. Since Sister Swing is a coming-of-age novel and an important part of growing up is becoming sexual, Lim says that she had to find ways of writing about it without being either too graphic or evasive. I thought she'd struck just the right note in the extract she read from the first chapter ... about the girls examining their private parts in the mirror! The novel also explores racism in the US (Lim's adopted country) which she sees as not just a question of white vs. other, but also other vs. other (for example, the riots in LA pitched Koreans against blacks). Lim describes herself as an "equal opportunity offender", drawing attention to different permutations of prejudice in the novel, which features also a white supremisicist boyfriend. Lim described how she tried to overcome the problem of giving the three sisters distinctive voices. She has Swee speaking Manglish in the novel which she says is hardly ever represented on the printed page. If I don't try to write in Malaysian English now, then when? And if I don't do it, then who will? Is it a little churlish to point out that Kee Thuan Chye has used it to great effect in his plays and in the extract from his novel in progress (which progresses no further sadly) published in New Writing 10? Malaysian writers really do have a struggle to position their writing. Just who are they writing for? (Writers in Britain and the US I think cannot even conceive of this struggle, for obvious reasons.) Lim says that she was intitially targeting the Asian American audience, but as she wroe the book it became more and more Malaysian. The book is published in Singapore by Marshall-Cavendish and in fact there are problems of distribution in the US. How do local publishers break into the overseas market? (This is a problem that bedevils Raman too.) As Lim says, there is "unadulterated prejudice" against non-American, non-British publishers. In all, it was a lively event and raised some very pertinent issues for local writers. I was happy to get my copy of Sister Swing signed, and meet up with a ton of friends. Hmm, i heard shirley on radio the other day and contemplated going to her readings. But since I'm at Amcorp Mall right now and on my way to Megamall, and she's at the Curve today, I guess I'm not going to see her after all. Thank goodness for your blog. Look how much I have missed even though I was physically present! By the way, since US bookstores do not stock books by non-American and non-british publishers, wouldn't that handicap readers there, depriving them of foreign literature? Shirley Lim...What a pity. She's Professor of English at University of California, Santa Barbara, specialising in Asian American lietrature (an authoritaive critic in the field) and Creative Writing. I would have love to meet her, discuss some critical issuew and probably ask her about the possibility of pursuing a PhD in the States. As for her writing...I guess she couldn't help but 'pander' to the market she's writing to... What's more, her geographical and cultural dislocation as an Asian American has led her to stand in a fluid and ambivalent out/insider position that can only at best resolve itself through such artistic sacrifices and compromises. Sexual awakening is also rather interesting...as a site of cultural and gender contestations, negotating the different identities and affiliations of being Asian, American and a girl/woman... and ultimately in finding and locating the self. Other vs Other...whoaa...that I haven't really heard of yet, but how pertinent it is. Sharon, thanks for a very informative and thought provoking post. I don't feel so bad for having missed it cos you got it down here. Re Manglish resulting in a reviewer commenting on the book as being shoddily edited : I wonder if other writers get this type of review due to their usage of other patois, say, West Indian? I guess it's because American and British folks aren't familiar with Manglish. I'll be swinging by the bookshop to get Swing Sister. "But when she read it, it's "she no like that". Isn't that broken English and not Manglish? :P"
If that's her version of Manglish, no wonder a reviewer commented about the book being shoddily edited. Correct me if I'm wrong but "She no like that" in Manglish would be "She not like that one." Sharon - "Mr Tang's Girls", from which Sister Swing originated, is in the book I showed you last Thursday evening. I wish I'd been there to show her the book. As you said, it's not on her list; I wonder if she remembers having published it? I'll go read "Mr Tang's Girls" to check if it has any Manglish in it. yup, true Manglish would be "she not like that one lah" or maybe "she where got like that one ?" These ppl, dunno tok what. "here is "unadulterated prejudice" against non-American, non-British publishers." I'm not saying that is exactly what she wrote, but it's similar. :P What she read out is what you'd see in American shows of how chinese americans would say it. It doesn't sound like us at all. :P I mean, since we're so use to hearing Manglish, it sounds normal to us, but when she speaks it, it's just odd. I don't think one could point to any style of Malaysian English (Sharon, I hear you on the linguistic objection!) as the definitive form. Singaporean English sounds awfully similar. anon, I very good in Manglish one. For even more Manglish terms, refer to Lee Su Khim's Manglish : Malaysian English at its Wackiest! It's hilarious. Intelligent _men_ don't have it much easier. It's not nice to read a book and come across something that's manifestly illogical. Or to read and find that the author didn't really do much research when it comes to names. This happens in cheap sword & sorcery books -- these people used to have names like "Conan" and "Ghak" and my personal favourite, "Dian" (means "candle" in Malay). They used to come from places like "Cimmeria" and "Pellucidar". Now they're all Tyrannids who come from Tyrannia. Which is another reason why I don't read much these days.